Foodpanda launches Scholarship 2016 with $3,000 cash prize. Leading food delivery company to nurture and inspire young talent with this new initiative, which is open until 11.59 pm on Friday, 16th September 2016. 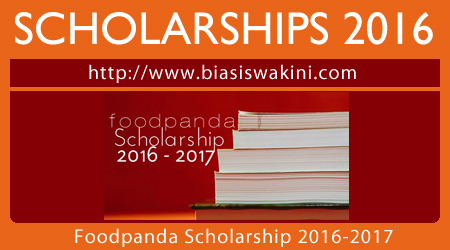 Singapore, Friday 17th June 2016 - Leading food delivery service, foodpanda Singapore, has announced a new scholarship for tertiary students: The foodpanda Scholarship / Biasiswa FoodPanda. Designed to turn passion into profession, the foodpanda Scholarship will award a tertiary student in Singapore with an invaluable industry experience at the foodpanda head office in 2016 / 2017, in addition to a cash prize of S$3,000. foodpanda recognises the importance of empowering the societies it operates in. The foodpanda Scholarship in Singapore has been created to find, inspire and challenge the next superstar in digital food marketing. To enter, applicants are asked to recommend a marketing approach for foodpanda’s very own foodpanda Magazine which runs online at magazine.foodpanda.sg. The suggested campaign should promote and strengthen the visibility of foodpanda Magazine - a market-leading, food-lifestyle blog in Singapore covering the latest news in food, travel, fashion and lifestyle. The magazine features aspiring chef interviews, best places to dine and in-depth knowledge about the F&B industry in Singapore and the region. Winning entries will be selected based on creativity, innovation and relevance to the theme, as well as their analytical skills and academic results. The candidate with the most insightful submission will be awarded a grant of S$3,000 and receive the chance to implement their vision during a summer internship at the foodpanda Singapore corporate office. Regardless of outcome, the first 100 complete submissions will receive food vouchers totaling S$30, while all other participants will receive a one-time 30% discount on their foodpanda orders which will be valid for a month after the end of the scholarship. foodpanda welcomes applicants from all years and fields of study in tertiary institutions in Singapore from today and will close the contest at 11.59 PM (GMT) on Friday, 16th September 2016. Applicants will be assessed based on academic results and the quality of the entry. A passion for the F&B industry is a plus. foodpanda, is a mobile and online food-ordering marketplace, active in more than 24 countries across five continents. The company, launched in Singapore in 2012, enables restaurants to become visible in the online and mobile world and provides them with constant evolving online technology. In Singapore, foodpanda offers food delivery from over 700 restaurants, including Nandos, Burger King, Meatsmith, 4Fingers and Real Food. For consumers, foodpanda offers the convenience to order food online with a wide gastronomic range from which they can choose their favourite meal on the web or via the app. Contact scholarship@foodpanda.sg should you desire further information. 0 Komentar untuk "Foodpanda Scholarship 2016-2017 - Biasiswa FoodPanda"